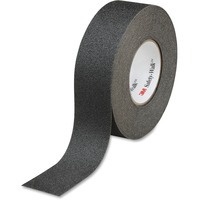 Safety Walk Slip Resistant General purpose Tapes and Treads 610 features high performance adhesive for easy application. Mineral coated, slip resistant material is adhered by a durable resin to a pressure sensitive adhesive backed plastic film. Use in light to heavy shoe traffic areas. Tape works on flat surfaces, steps, stairways, entrances, ramps, ladders, lawn equipment, snowmobiles, scooters, construction machinery and vehicles. Highly durable surface withstands the rigors of equipment traffic. Low profile design helps reduce trip hazards.